Up early. I grabbed some coffee in the lobby and got permission from the motel proprietor to leave my car for a couple days. When I returned I found Isam had discovered his cycling shoes had somehow not made the trip. Hmmm, what to do. I considered going to get the shoes from home, and sliding the whole trip back one day, but this would be easier accomplished with a phone (mine is in for repairs). A “bike shop” exists in Springerville, but all photos of the store show them to be skiing-specific. The closest real bike shop is in Show Low 45 minutes away, and that shop didn’t open until 10AM. That’s the plan, then – we’ll wait until they open, hopefully buy some shoes, and be on our way. More 10000 Dice to bide the time, then an early ride to Show Low. We stopped to gas up and then had fun inflating the SUV tires. Trying to inflate and check the pressure of all four tires within the few minutes of time given by those machines is always comical. We looked like Keystone cops whirling around. Next stop a tasty breakfast at White Donuts café. 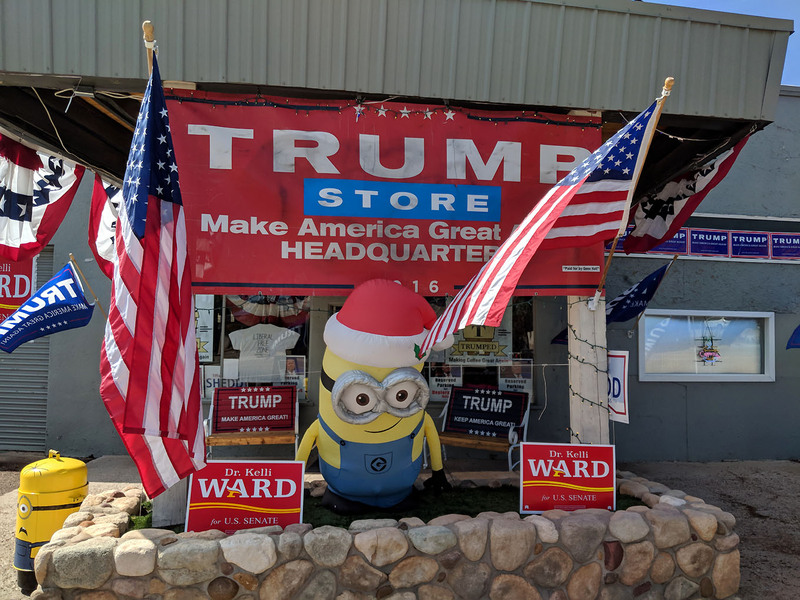 Beside resides the bombastic Trump Store. We laughed and took a few pictures outside. 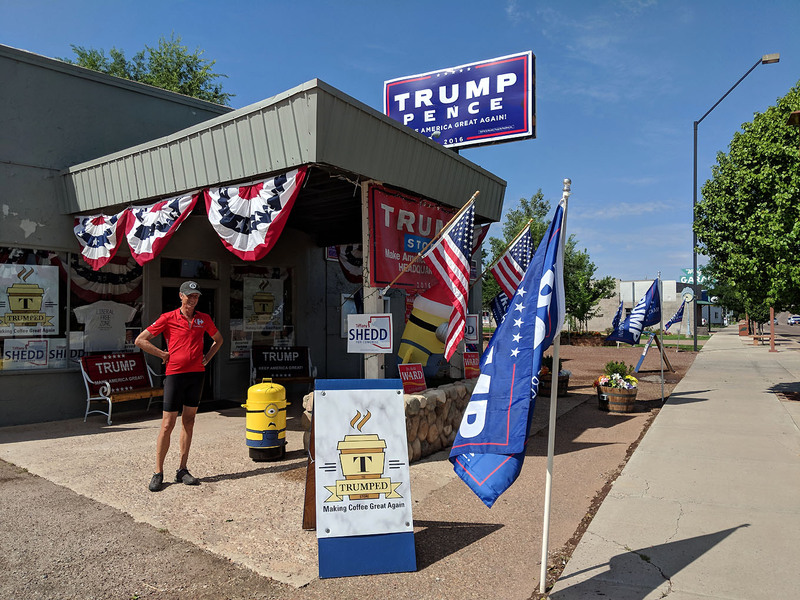 In retrospect, we really should have gone inside and maybe picked up a tee-shirt to commemorate what will soon come to be known as either the best or worst president in 244 years of American history. But I digress. We found Cycle Mania but browsed around Classic Cookware for a while waiting for the shop to open, chatting with a very pleasant lady there. 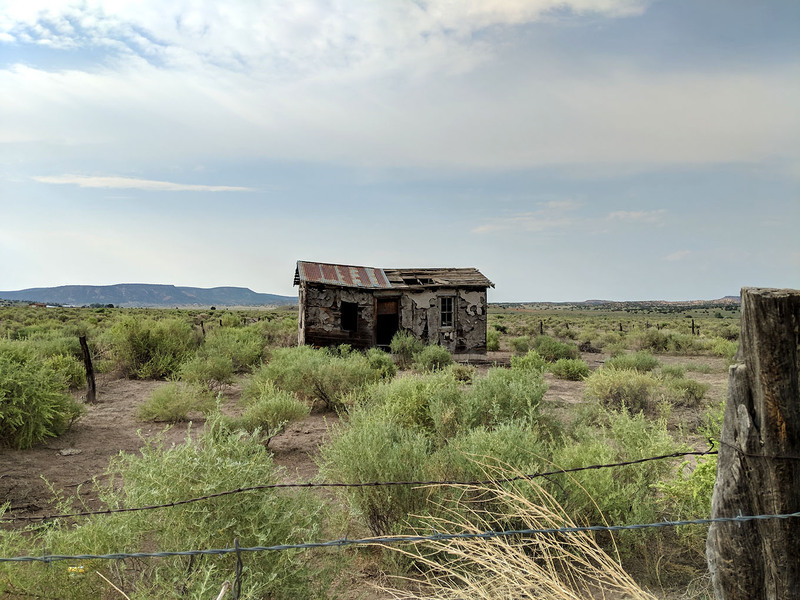 Back to Springerville! We hit the Safeway for road food and liquid since there are no businesses the entire 1st day. The usual stuff – pre-made sandwich, Gatorade, Wheat Thins, Party Mix, cookies. Back at ABV Inn, we made final preparations amidst another group of 8 or 10 cyclists. We learned they are a supported cross-country tour going South Carolina to San Diego. Nothing too cushy about it though – their plan is to complete the trip in only 40 days. Now 31 days in, these guys all looked like seasoned road warriors. They thought what we were doing was cool, and we thought the same about them. Off through town, then out east on US60. Let the tour begin! 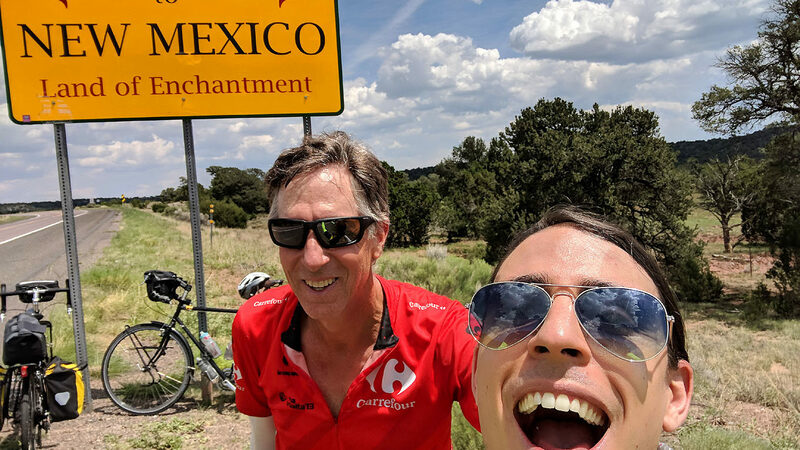 Seventeen miles to the New Mexico state line. Let the climbing begin! There are only a few hundred foot hills here, but enough to get your motor started. At least temperatures were pretty nice, in the 80s (not the 110s like at home). 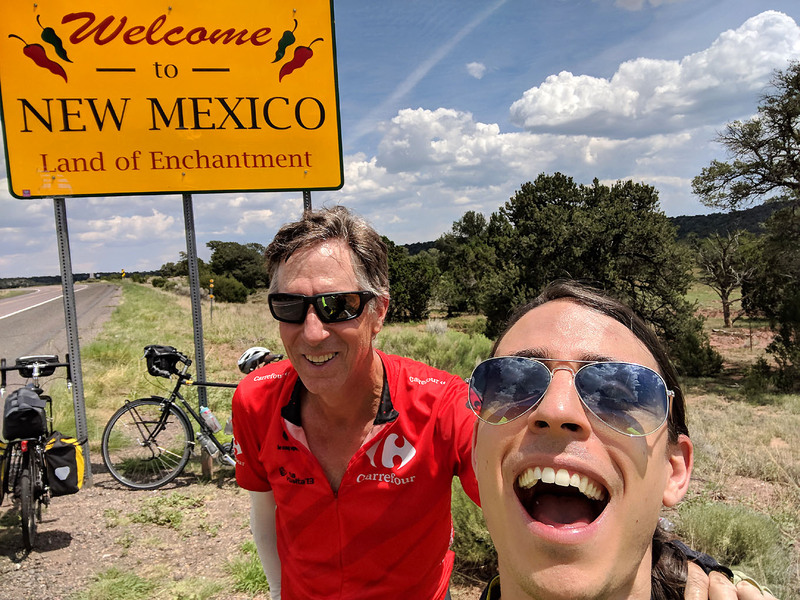 The shoulder ends in New Mexico (NMDOT please get with it), but at least the traffic is sparse, and all drivers were respectful of us. US60 goes almost due east through very wide open high desert (7000’ elevation) with rolling hills. The views go for miles and are amazing. 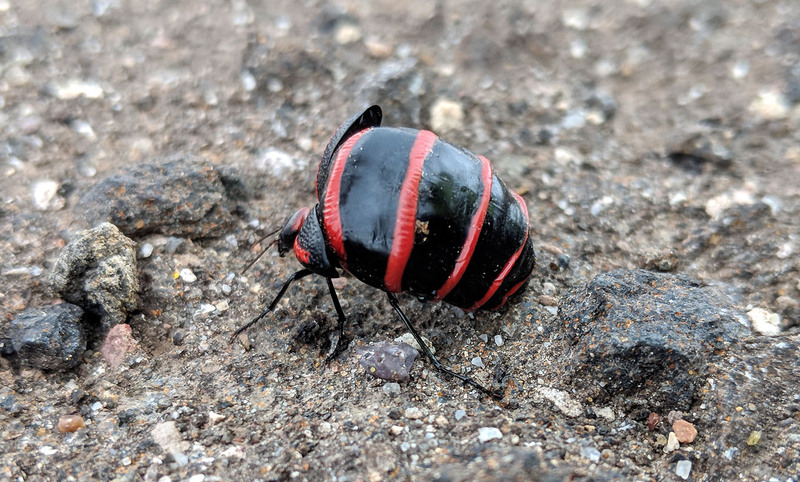 Isam found a really cool red and black striped bug trundling along the road and stopped to take photos. We later consulted whatsthatbug.com to learn it was a blister beetle. Seems they only live here in New Mexico and Texas, so it was a very cool sighting. The Day 1 route is exposed to both sun and wind and we got a good helping of both. As a bonus we also got about 45 minutes of light rainfall – very pleasant. Around the 40 mile mark a final 500’ climb tests a rider. There are three false tops that trick the eye into thinking you are done. Still, the next thing we knew we were flying 7 miles down into Quemado NM. Isam was a little speck way out in front of me. 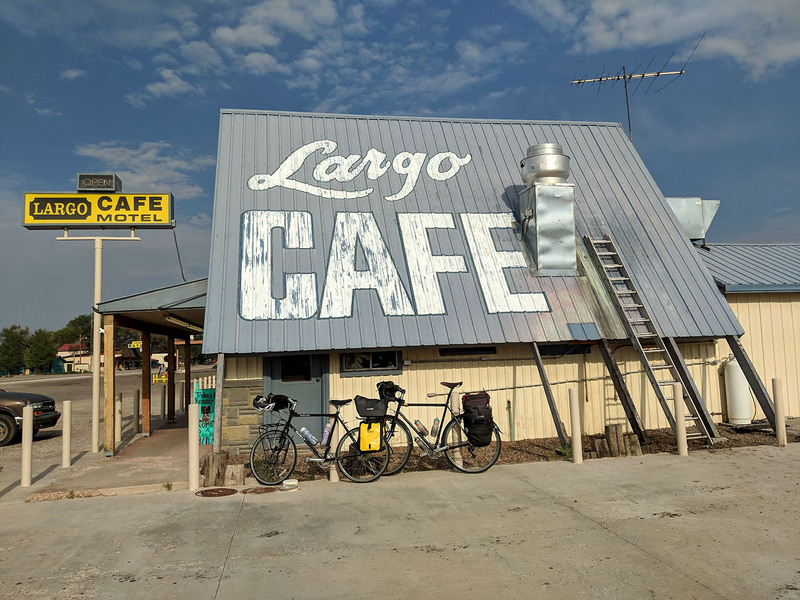 Largo Café & Motel for the night. The staff there is folksy and friendly. They know how to make good food, too. Isam had some kind of big smothered patty. I ordered, with some reservation, a sirloin steak. No reservation needed – it was a thick juicy cut perfectly seasoned and perfectly cooked, with mash ‘tatoes and broccoli on the side. Yes! Big plates – more than either of us could eat. We sat for a long time, eventually gabbing it up with our server. She talked about her smart son who was forbidden from video games, and about how she was using wooden pallets to build her house. A great 1st day on the road. Speaking for the two of us, I’d say we were both comfortably sore.